While Kanye may be off producing 30 minute super music videos that don’t make any sense, the band Daft Punk is actually doing an incredible service to the world of geek by producing their newest music video for the song Derezzed completely in the world of TRON: Legacy. The electronica band is doing all of the music for the film (yes, just like Queen did for Flash Gordon) and if the rest of the songs on the album are anything like this one, you can expect some intense score for the rest of the film. This new music video gives us some great new shots of the TRON world, including suiting up in the infamous suit, having a light disc battle, and even racing along the endless field of circuits. Check out the music video after the jump, and be sure to catch TRON: Legacy in theaters in both 3D and IMAX this Christmas. “Holy addictive gameplay Batman!” That’s the first thing that comes to mind after sitting down with DJ Hero for just a few minutes. For those who haven’t been following our DJ Hero coverage here on the Flickcast thus far, is an extension of the Activision Hero franchise that started with Guitar Hero and also now includes Band Hero. Taking a step back from the full band four player party experience, DJ Hero focuses on the single player experience with little hints of two player action. DJ Hero also comes with a steeper learning curve than the guitar focused games and isn’t going to be the kind of thing someone can hand to an uncoordinated friend and expect them to quickly pick up and play. Like Guitar Hero, DJ Hero couldn’t come in to existence without a custom made peripheral to play it. 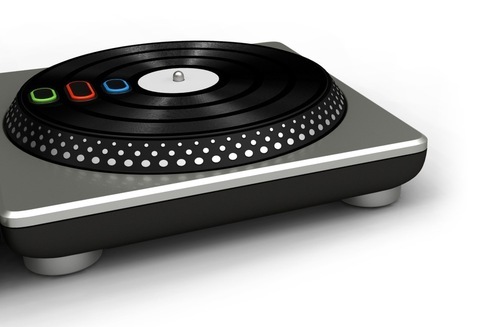 (Well it could, but then it’d be no different from Boom, Boom Rocket for XBLA) Enter the DJ Hero Turntable. Unlike a classic DJ turntable, this one already has a “record” attached with three buttons built in to it. We’ve got a new intro cinematic video to share with you today showcasing the cool upcoming DJ Hero game from our friends at Activision. I’m going to go out on a limb right now and say this game, based on all the stuff we’ve seen so far and the caliber of artists involved, could end up being as big as Guitar Hero. I know, that may sound crazy, but this game seems to have what it takes to succeed with its innovative design and new turntable controller. Plus, its got some great music from artists like Jay-Z, Eminem, Daft Punk, The Scratch Peverts, Grand Master Flash and DJ AM which only enhances its potential awesomeness. I guess the jury is still out but I, for one, can’t wait to get my hands on the game. DJ Hero and DJ Hero Renegade Edition ship to North America on October 27th for Xbox 360, Wii, PS3 and PS2. Until then, be sure to check out the video of this cool into cinematic after the jump. With the epic battle between Guitar Hero and Rock Band waging on these past few months, the fans have only been caught in the crossfire of awesomeness. First, fans get to take a swing at metal with Guitar Hero: Metallica, then Rock Band retaliated with their Beatles expansion last week. Now it looks like the Heroes are swapping a guitar for a turntable in DJ Hero. We’ve had quite a bit of news surrounding this fresh new game, and we’re all pretty excited about it’s release. We’re now getting word that the legendary techno funk band Daft Punk will play a pretty big part in the game as one of the playable DJ’s and even a handful of their songs. Check out the newest trailer featuring Daft Punk and their songs included in the game after the jump. Don’t forget to grab DJ Hero in stores on October 27. The impressive crew of turntable legends bringing mixes to Activision’s DJ Hero continues to grow. PR Newswire announced today The Scratch Perverts and DJ Yoda will be joining the list of contributors to the game, which includes DJ Shadow, DJ AM, DJ Z-Trip and Daft Punk. The Scratch Perverts have spun five mixes including M.I.A.’s “Paper Planes,” while DJ Yoda has created two mixes that will appear on-disc when DJ Hero drops this Fall. Expanding upon the revolutionary easy to pick up/challenging to master gameplay mechanics found in Guitar Hero, DJ Hero delivers an all-new interactive music experience that allows players to experience and hear music in an all-new way. With over 100 individual songs, highlighted in 93 unique never-before-released mixes that blend genres of music, including hip-hop, pop, rock and dance, DJ Hero delivers the most diverse and international collection of music ever assembled in a music game. Created exclusively for DJ Hero, the turntable controller allows fans to utilize various techniques including scratching, blending, cross fading and sampling, while leaving room for creative expression with a variety of effects and player chosen samples and scratches. DJ Hero will be available on October 27. Until then, check out this video of DJ Yoda doing his thing after the break.